DataBasin is now able to create records in SalesForce.com starting from a CSV file. 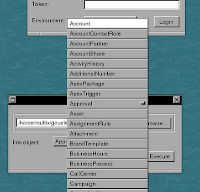 First, as shown in the screenshot, the already implemented method describeGlobal retrieves the available objects to insert into. Once the user selects them the CSV file is read and the objects get created. There is no provision yet for mapping the fields, the first line is assumed to contain the field names. The API implemented by DBSoap is now getting a little more complete step after step. The basic operations of creation and query are already possible. I implemented describeGlobal in the DBSoap layer of DataBasin which communicates with salesforce.com. Thus a list of all objects in the system can be queried, standard and custom objects. The return is just an array of strings. Step after step I am recreating a simple API interface to the salesforce.com Web services in pure Objective-C.